The terms "dove" and "pigeon" are used somewhat interchangeably, doves are usually considered to be the smaller species. They're medium sized birds that primarily feed on seeds, fruit and plants. 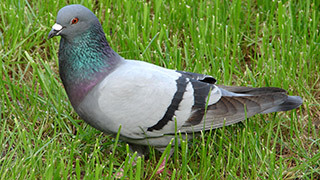 Feral pigeons can be found in many cities around the world and are sometimes called flying rats and considered a pest.